Excellent fit and finish. Lightweight but milspec strong . Much better than kac ras on my colt le6920. This was the first purchase I made for my Smith and Wesson m&p 15 build. Recommended to me by a friend, I couldn't be happier with my purchase. It's a well made part, rugged and durable. Installation took zero effort, didn't even need the recommended tool to hold the mounting bracket back. A longer rail would be beneficial, but for the simplicity of not removing the forward iron sight, this was the was to go. Now I have a more versatile AR that I have already attached a foregrip, bipod and quick release sling to. I have an Adams Arms piston carbine and this handguard fits perfectly; the toprail aligns exactly, there is no wiggle at all and the rail itself is very versatile. Definitely recommend to anyone, especially Adams Arms owners. I am a new AR owner and it took a bit of time to research which handguards fit which configurations. I was afraid that this handguard wouldn't fit without some kind of trouble/modification but it dropped right in. 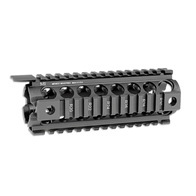 It was even easier than the factory plastic carbine drop-in handguard is to install! Super precise design and good quality at reasonable price, very happy with product! This was a great drop in handguard super sturdy great qd placement and with four of them easy to setup your sling to suit you. Superb quality and a great value you'll never regret a Midwest industries piece. Would recommend to anyone wanting a simple to install yet rugged handguard.